Trust me on this. I’m not just a lifelong contrarian. I also spend 365 days a year on the road. Technically, I’m homeless. And this tried-and-true advice has not failed me yet. More than a decade ago, my editor put me up to this on-the-road lifestyle. You want to write about travel? Walk the walk, he said. I had no idea what I was agreeing to. Fortunately, you don’t have to sell most of your earthly possessions and squeeze everything into a suitcase in order to learn the same lessons. 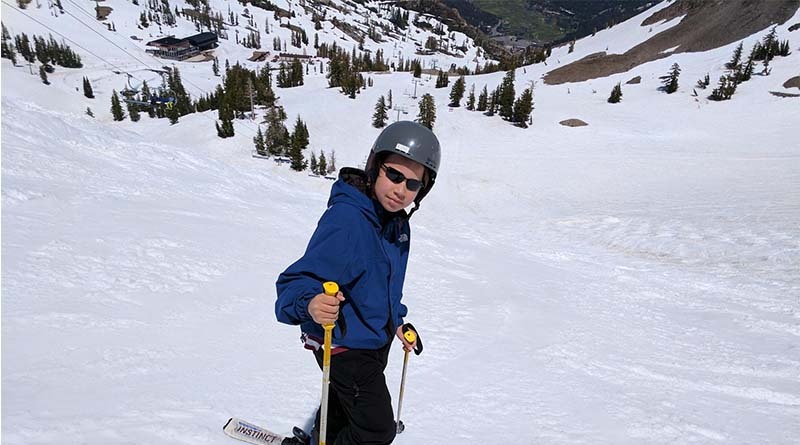 Iden Elliott making a run at Squaw Valley in June 2017. Last year was a great ski season for contrarian travelers. It takes a little while to wrap your head around summer skiing. People are out there in shorts — or less. But when you think about all the money you’ve saved by being there in the off season, all the crowds you avoided, you realize that this is the best time to visit a ski resort. Of course, this season is different. It’s been dry and warm, and as I write this, a little more than half of the resort’s trails are open. You know what that means? California’s beaches sure are looking nice right about now. 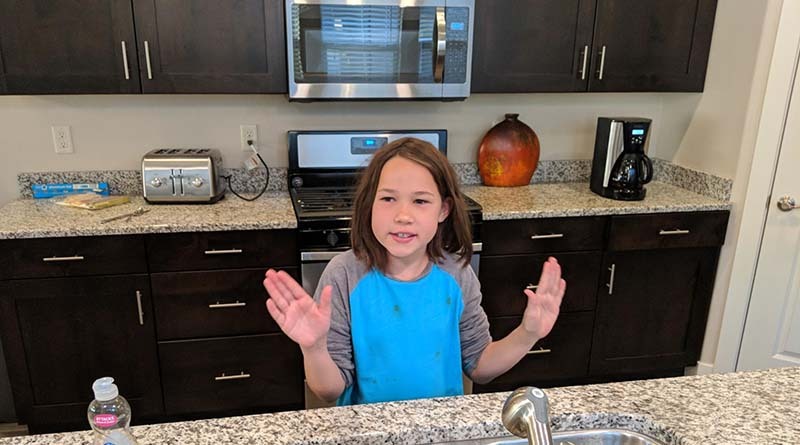 Erysse Elliott prepares to clean a pan after breakfast in a Vacasa home rental in St. George, Utah. When you’re on vacation, there’s an unspoken rule that you have to eat every meal in a restaurant. It’s nonsense. If you find the right vacation rental and grocery store, you can save a lot of money and avoid the “Vacation 10.” Oh, you know exactly what I’m talking about. In St. George, Utah, a few months ago, I rented a Vacasa home that happened to be right around the corner from a Harmons Grocery store. If you’ve ever been to Utah, you probably know Harmons — great selection, terrific in-house bakery, friendly staff. Why would we go anywhere else? Well, OK, we made a detour to the Great Harvest Bread Co. for lunch one time, but other than that, it was Chez Vacasa for us. As a consumer advocate, I often talk about the value of politeness when you’re trying to resolve a dispute. But it’s never more important than when everyone else is being rude. Case in point: A few months ago, my kids and I were stuck in New York’s JFK airport when JetBlue Airways canceled a connecting flight to Orlando. I stood in a long line and watched in horror as angry passengers chewed out the ticket agents. After a one-hour wait, it was our turn. I took a deep breath and, even though I wanted to give the agent a piece of my mind, I turned on the charm. JetBlue (with an assist from my capable travel agent) quickly fixed the problem, covering a hotel and meals, and paying for my next flight out. Something tells me the yellers didn’t get the same treatment. My kids have watched and learned. This summer, when we cruised on a small ship called the Chichagof Dream in Alaska’s Inside Passage, the words “please” and “thank you” opened a lot of doors, sometimes literally. 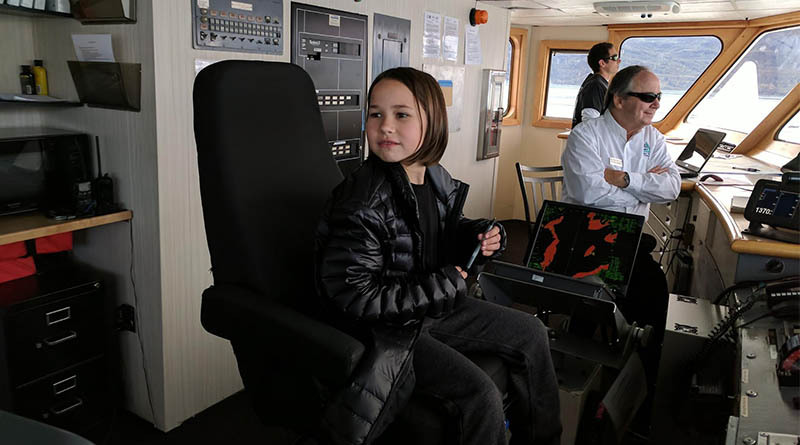 My daughter, who loves to cruise, spent most of the trip on the bridge chatting with the captain. 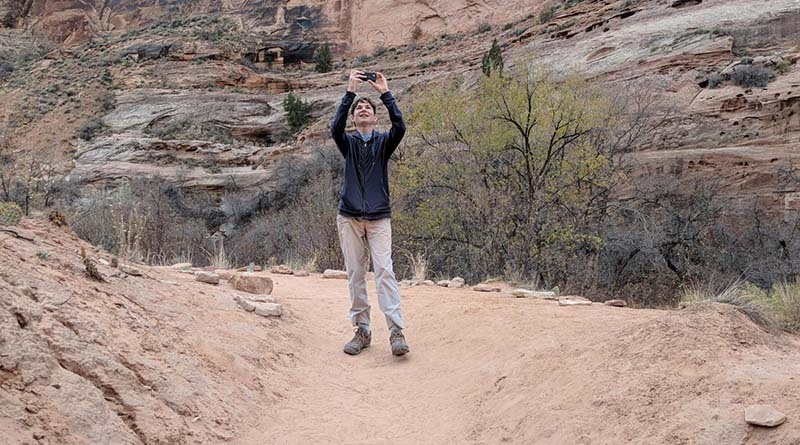 Aren Elliott takes a picture of the rocks in Sedona, Ariz. He’s been on this contrarian adventure since 2002. You’re probably wondering how I ended up on this 365-day-a-year travel adventure. In 2001, when I worked for National Geographic Traveler, my editor, Keith Bellows, pulled me into his office. We were expecting our first child (now 15, pictured above). “Where are you going to take him?” Bellows asked. “I don’t have any plans,” I said. Over the next decade, National Geographic nudged me into full-time travel, assigning stories and offering me all the space I wanted on Nationalgeographic.com. I’m forever grateful to Bellows for setting me on this course. The writing assignments evolved into a blog called Away is Home, a Twitter and Facebook page, and now, a new column called Away is Home that will appear here every week. Away is Home is about the lessons the road can teach us. Like the story you’re reading, it’s contrarian in almost every way. Travel advice columns are often penned by urban travel writers who parachute into a destination for a few days. We spend a month at a time in a place, living in real homes and meeting actual residents. Many travel stories you read are also tightly controlled by the destinations, which cover a writer’s expenses. We pay our own way, thanks to my day job and blog sponsors who offset our travel costs. In other words, I can actually tell the truth about a place. And most family travel features are written by moms. This one’s written by a single dad. I’m not a fan of labels, so calling this a “family travel” or “adventure” feature is really selling it short. It’s more than that. Maybe it’s just a contrarian travel column. Thanks for joining me for this trip of a lifetime. We’re going to learn so much together.